God is the ultimate highest power, and for us to serve God we must be submitted under God. The definition of Lord is owner or master, and if we will profess that Jesus is our Lord we must recognize his authority over us and our lives. This means that every part of our lives belongs to God. We should not defile the temple of the Lord which is our body, with unhealthy eating habits or unclean sexual acts. We should not bow down to other Gods because we will contaminate our spirit, which have become one with God. And we ought to guard our hearts and minds, from hardening our hearts or building strongholds against the knowledge of God in our minds. 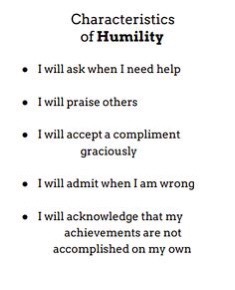 Humility: to think of yourself as of lower importance. Many people dismiss this word altogether, maybe because it sounds so modest and weak. But truthfully it takes a person of confidence in self and certainty of character to be humble; and not be humbled. To humble oneself is to think of yourself less than the person being addressed. Isn’t God of more importance in our lives? Would we want to disappoint God, or disobey Him? Many relationships fail because they refuse to put themselves aside, and put the other person first. Another aspect of Gods’ hand, is his hand of judgment: of vengeance and blessing. God cannot act, if we take on the role of God in our lives. If we humble ourselves to give God acknowledgement and to accept who He says He is in His word, then God will act. God says do not repay those who do you wrong with revenge, mine is the vengeance. It takes great humility for us to leave such feats to God, right!? It is much easier, faster and gratifying to take matters into our own hands. God’s word also says that He created everything seen and unseen. He knows the amount of hairs on our head. He knows our needs and He will provide to us according to our needs. Another aspect of the Lord’s hand is accepting God’s sovereign decisions. The bible says that God gives and God takes away, but that God’s name should be praised in all circumstances. God is a good God, but He know our caliber and capacity and He knows how much we can take. God is like a personal trainer, He will push us to the most pressing limit. God actually pushes us until we are broken. Because broken vessels He can mold. You may not understand it, but God knows what He is doing. Dear God, I come before you recognizing that you are God and I am not. I want the blessings, I want to repay those who have used, abused and hurt me, and I want to understand every thing- but Lord I lay this before you. I give you back everything that belongs to you. And I ask you to help me to recognize when I am trying to be my own God, and when I am feeling anxious as if you will not come through for me. I pray your strength to restore and restrengthen us all who may go through those times, and I pray for peace in our souls. In Jesus name, I pray Amen.